A quantitative measure of adsorption may be, and usually is, based on the following general definition: Adsorption of one or more of the components, at one or more of the phase boundaries, of a multicomponent, multiphase system, is said to occur if the concentrations in the interfacial layers are different from those in the adjoining bulk phases, so that the overall stoichiometry of the system deviates from that corresponding to a reference system of homogeneous bulk phases whose volumes and/or amounts are defined by suitably chosen dividing surfaces, or by a suitable algebraic method. 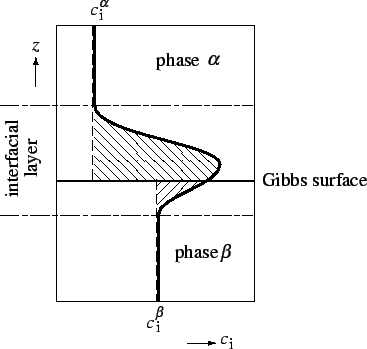 Gibbs dividing surface (or Gibbs surface10) is a geometrical surface chosen parallel to the interface defined in §1.1.2 and used to define the volumes of the bulk phases in applying the foregoing definition to the calculation of the extent of adsorption, and of other surface excess properties. For flat or only slightly curved surfaces one is free to define the position of the Gibbs surface in the manner most convenient for the discussion of a particular problem. In what follows it is assumed that this freedom exists; it must be remembered, however, that for surfaces whose radii of curvature approach molecular dimensions, the definitions become ambiguous. Excess thermodynamic quantities referred to the Gibbs surface are denoted by superscript to distinguish them from quantities relating to the interfacial layer, for which superscript is employed. The surface excess amount or Gibbs adsorption of component , which may be positive or negative, is defined as the excess of the amount of this component actually present in the system over that present in a reference system of the same volume as the real system and in which the bulk concentrations in the two phases remain uniform up to the Gibbs dividing surface (see Figure 1). Figure 1: Schematic representation of the concentration profile ( ) as a function of distance ( ) normal to the phase boundary: full line (bold)--in the real system; broken line--in the reference system; chain-dotted line--boundaries of the interfacial layer. The surface excess amount per unit area (surface excess concentration ) is given by the sum of the areas of the two shaded portions of the diagram. Corresponding definitions can be given for the surface excess number of molecules, , and the surface excess mass of component , and for the related surface excess molecular concentration and surface excess mass concentration. The detailed application of the Gibbs definition of adsorption to interfaces of different kinds is discussed in the following sections (§§1.1.9; 1.1.10; 1.1.11).